There is something that has always been deeply fascinating to me about Sinistro. This is a band who understand the doom metal genre in a way that few of their peers can match. Their brand of perfectly arranged and gorgeously written art doom has captured my imagination for years and has shown me strange new futures from a band who seem destined to take over the doom world. This is music that requires patience to be sure, but it’s also music that you want to really sit back and sink your teeth into to properly understand, trust me, it’s worth it. A far step removed from their debut release Sange Cassia is the sort of record that relies on its progressive leanings as much as its doom ones. Unlike other prog by way of doom bands out there like Pallbearer though, it feels like Sinistro are focused more on the sheer transcendence of the art rather than creating songs as such. The overall vibe of Sange Cassia seems to be the larger goal here and I’ll admit, I found myself getting lost in what it had to offer more than a few times. There is a sublime and subtle poetry to tracks like Nuvem that entrances the listener. In fact, this record is perhaps musically closest to the 2016 masterpiece Mariner from Cult Of Luna & Julie Christmas, it has the same ethereal potency making for something that you can really get lost in. 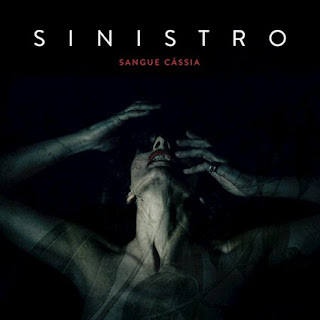 With a striking sense of drive and a forward motion defined by overarchingly powerful themes and a sense of vision that makes for an encompassing musical experience Sange Cassia is a surprisingly easy listen. Rather than forcing you to really pick apart at the long form songs that define this record you are invited to just sort of journey with the artists. Swooping this way and that and discovering exotic new musical twists and turns everywhere you look. While this is indeed a difficult way to wrap your head around things it also makes for rewarding listening that you will never quite escape.